Exterior graphics are a cost-effective way to promote your business, trade show or meeting. Our custom exterior signs make a bold statement and are ideal for almost any outdoor application. 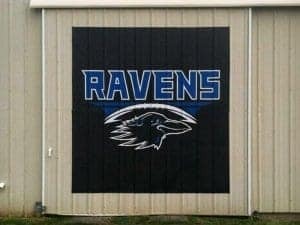 Our premium weatherproof graphics are long lasting and will stand up against the elements. They feature a durable backing that was specially created for exterior uses. In addition, our exterior graphics can be easily removed as your message changes. Advertise your service, business, product or event with a high-impact, custom exterior sign. A removable wall graphic is perfect for when you want to make a bold statement that will capture peoples attention. We can create a custom exterior graphic that will convey your message the way you want. Create a painted-on look to your wall with our unique concrete-conforming wall graphics. These graphics are made out of a unique material that allows them to conform to the wall, creating a clean and tasteful look. These graphics are great for brick, concrete and cinder block. Custom outdoor and sidewalk floor graphics are the perfect way to encourage customers to visit your business or event. These floor graphics and decals can be custom designed to suit your needs. They are available in a variety of shapes and sizes. 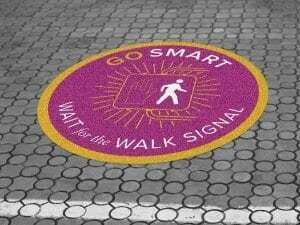 Our sidewalk decals and floor graphics stickers will adhere to a number of outdoor surfaces, including pavement, brick, and asphalt. These are durable to provide long-term use. 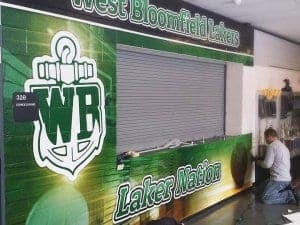 You will find that we carry a variety of exterior graphics to meet any need. Our bold, custom exterior signs will make your statement loud and clear. You can create a great first impression, direct customers and deliver your brands message with a customized exterior graphic from Sticker Genius.